1) TRANSITIONS & NEW MODULES: I addressed a minor issue to do with a global variable not being correct with respect to the inventory on a new load. Having addressed this, I had introduced a minor timing issue that caused a new (minor) transition issue (which we experienced on the night), but I have now fixed both of these issues in the latest version too. See also the AI tweaks next. 2) AI TWEAKS (HENCHMEN/SUMMONS/COMPANIONS): At a player request, I took a closer look at the way henchmen (and summons) - and even the companions behave in given conditions. In particular, I wanted to improve the "obedience" of henchmen (e.g. Scraps) and summoned creatures with respect to combat. i.e. To "stand ground" or "follow" their master even when in combat. i.e. A player can now override the "seek and kill" behaviour of these creature types to act more like the way companions do, and gives the player more control of these types. For companions, I have now made it so that they automatically "follow" after entering a new area, even if the player has the "red brain" representing the AI as disabled. i.e. Even when the AI is OFF, companions will now follow the controlled main PC (and continue to follow) after an area transition, until another "stand ground" command is given again, or the player switches PC. Furthermore, if a player now disables "Auto Pause" from the main menu, the game will now switch all followers to AI on, warning the player to turn AI back off again if they want their followers to remain in Puppet Mode. These "logic" steps will, hopefully, make more sense for players using a combination of the AI controls available, especially when making use of the Auto Pause TB Combat system. Simply put, the "brain" icon now simply switches Puppet Mode on (red - AI OFF) or off (green - AI ON), which turns both spell-casting and follow either on (green brain) or off (red brain) at the same time. NOTE: The "follow" and "stand ground" commands (both the new GUI and the original shout commands), override the current "follow" status of either AI setting to enable quick and easy movement. A final tweak was to companions (not cohorts, which I define as a player's created PCs), which now no longer have an influence change if a player merely "inspects" another persons property with their PC, but only when a player actually acquires "stolen goods" - and if the player is playing a "good aligned" party. E.g. A player may now try to open a chest, and the companion will stop them. A cohort does the same on the initial attempt, but does not stop the player thereafter, whereas a companion always will. If, however, the player manages to gain access to said chest and grabs the "stolen" loot therein, then the companion will react with a rebuke. 3) MONEY POUCH GOLD: This is about the third time I have addressed this issue, and after observing some debug feedback, I believe I have finally got to the bottom of the issue: The problem stems from using a function to retrieve the number of stacked items after an alteration to the original stack, even though the code looks solid. So now, I have resorted to using my own calculation code and the stack now returns correctly and the gold issue with respect to money pouches should be resolved once and for all. 4) OTHER MINOR FIXES: (i) Combination doors were giving too much XP (by a factor of 10). These have now been fixed. (ii) The White Empire Guardian now no longer has the "sewer problem" entry speech if the sewer problem has been resolved. (iii) I have increased the range of the "Gather Party" check from 10 meters to 20 meters, to help alleviate having to get too close to the transition object. (iv) Some gold loot items found on creatures were being received as "items" rather than the actual gold. I removed some old code that should fix this. Heroes Enter A Wolves Den! The Adventure Continues ... 18. 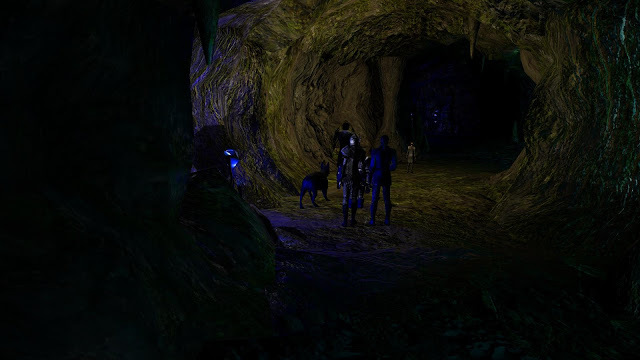 Dark Caves & Shady People! NB: Contains spoilers for ALL backgrounds. "It's not like I support everything they stand for", said Myara under her breath, trying to alleviate everyone's fears as the heroes entered the Thieves' Guild. The group remained silent as they passed through the foyer and up to the man in charge at the desk, who introduced himself as Travis Coldblood, and front man for Merkes. Conversation was a little jilted, even for Myara, who tried to act confident in front of her friends, but came across as a bit of an outsider herself. "How do we become a member?" said Myara, trying to gain better influence after failing to sell any of her traps and items to Travis. The shady dealer simply laughed, but after Myara did some quick talking, Travis agreed that the heroes could go and see Merkes if they really felt they were up to joining. Helden was not happy at all with the run of events, but Myara was curious to learn more. Merkes appeared a pleasant man, although his motives and smooth talking hid a darker side, which spoke about retrieving a gem for him (which Obi Sten had acquired from somebody else), if the heroes wanted to prove themselves as worthy to join his guild. The heroes agreed they would consider it and left the guild leader to check out other rooms within the secretive dwelling. It was not long before Helden and the rest of the heroes were turning a blind eye as the dextrous little halfling was pilfering her way through a chest she found in a side bedroom. "It's not stealing if it's already stolen. Isn't that what Merkes implied himself about Obi's gem?" Merkes' place also had a cellar, which the heroes decided to investigate. As they descended the stairs and into the room itself, the sound of fighting could be heard. They had entered a "training chamber" where various shady types were attacking dummies to help "improve their grip", at least that is what Scar said, the man in charge of the training area who spoke with them as they entered. Scar was no better than either Travis or Merkes ... all appearing to be of the same stock and breed ... and all with very selfish motives. In Scar's case, it seemed he had once tried to double-cross Merkes, and only just escaped with his life, and now at the mercy of his boss. Ever since the event, Scar has been trying to get back into the good books of his boss, and now asked the heroes if they were prepared to do a task for him: Search the sewers for some missing stashes of gold. In one of these stashes, there was also a small platinum statuette that was to be found. Scar was after this statuette, and if the heroes either recovered it for him, or retrieved the map from Grist (who had apparently run off with the only map of the location of the stashes), then he would reward the heroes for their help. The heroes said they would think about it and left the shady dealer to himself and decided to leave the guild for now. "Let's get back to searching for Monty!" said Helden after putting the experience with the Thieves' Guild behind him. 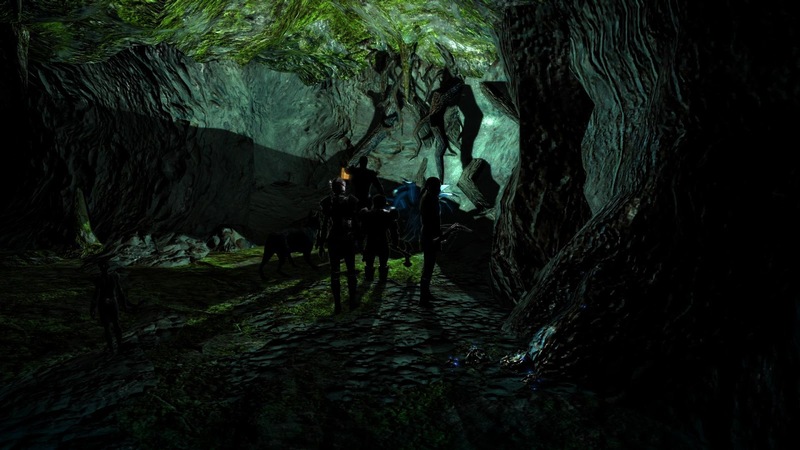 Everyone agreed and the heroes set off to the Shoreline Road, where they located the cave entrance they discovered earlier and stepped inside. Although lighter than expected due to some glowing flora, Helden nonetheless equipped his trusty bullseye lantern, and indicated that Myara should lead on, in case of traps. "I smell wolves!" grumbled the dwarf, Flint. And as if to prove his point, Myara started to run back to the group claiming a pair of wolves were close behind her. The wolves followed the halfling straight into the waiting arms of the two fighters, and so their pursuit was short lived as the fighters made short work of the combat. After the battle, the heroes continued their search along the dark tunnels of the caves. At the end of the tunnel from which one of the wolves came, the heroes found the remains of some clothing. Elana pointed out that the lack of blood on the clothing suggested the owner may still be alive somewhere. Hopefully, they belonged to Monty, and their search would not be in vain. "There are some good sources of iron and silver ore here." said Karasten as the heroes continued to search the cave system for Monty. Then, rounding one passageway, the heroes came face to face with another group of people, who Karasten recognised as Talanthians: an evil brotherhood from the far east who followed the evil god Talan. Combat with these normally distant and evil enemy was inevitable. As the evil clerics summoned their creatures, the heroes did the same. However, the might of the heroes was too much for this small scouting party of the brotherhood, and so it was not long before Helden was left picking through their remains in search for more clues as to what brought them here ... and why? Helden found nothing, except confirmation of a Holy Book that they were the Brotherhood of Talan. 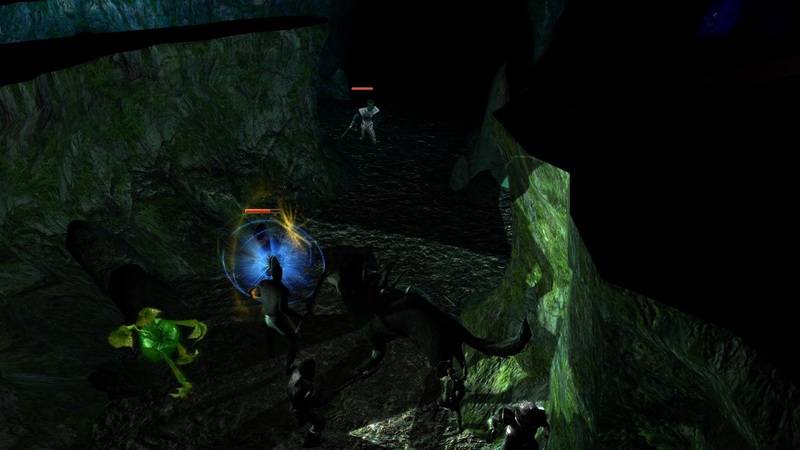 Continuing deeper into the caves, the heroes encountered a second group of the evil brotherhood and dealt with them in much the same way as the previous group. 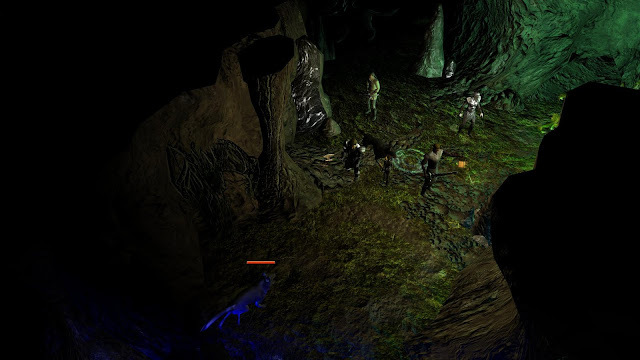 Eventually, however, as the heroes traversed another narrow passageway, they found themselves within a larger cave that had some kind of glowing portal within it. Karasten confirmed from the sigils that this was indeed some of the very rare Talanthian teleportation magik, but was unable to ascertain anything more from it. Then, as the heroes were discussing the portal, out from the shadows stepped a young female who introduced herself as Kasandra. Myara spotted somebody akin to herself straight away, and kept silent as the woman explained what she was doing here. According to Kasandra, she had been spying on the Talanthians for a number of days, since she heard rumours of their existence. She had been unable to ascertain their business, but did work out that the ones the heroes had encountered were only a scouting group, and that as it currently stood, she and the heroes had the element of surprise with respect to checking where the portal might lead to. Helden asked Kasandra if she might be interested in joining them in trying to learn more about it, but Kasandra, upon seeing how large the group already was, smirked at Myara and simply said, "I think your group is already large enough." Myara bit her lip and refused to rise to the bait. "However, as an alternative, maybe we should warn the authorities instead of going through just yet. After all, we don't know exactly what we will be facing." Helden stood thinking. 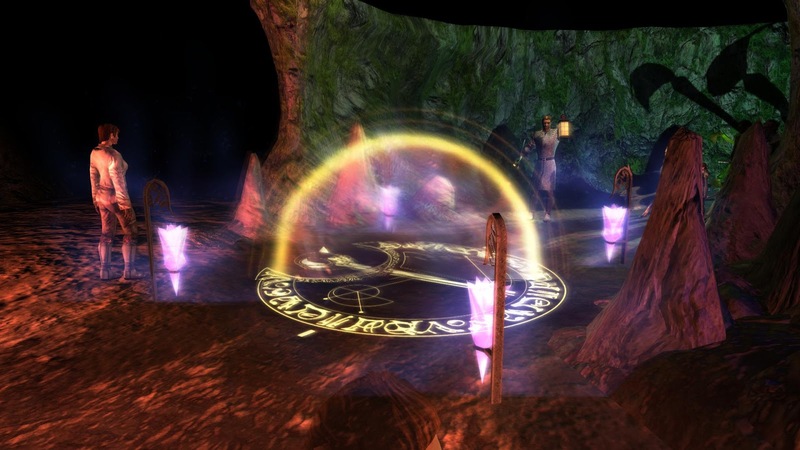 The group were already beginning to get tired, and even if they did try the portal now, how long could they pursue the adventure in their current state. Would it be better to get backup and inform the authorities ... or simply steel the moment and step into the portal now? He needed to discuss the options with the rest of the party, of which Myara was quick to point out that she liked the company they already had, and that they could not trust this Kasandra just yet anyway. Helden did not have the stomach to say that was not what he meant. TOTAL SESSION TIME (UNPAUSED): 1 Hour 52 Minutes. GAME TIME SINCE START: 32 Hours 34 Minutes. The Scroll still has a few more fixes coming along, so be sure to check back now and then if you can. For instance, I have discovered one or two additional fixes required even from our last session, which I address in the next fix. If you ever have the opportunity to play, please let me know if you experience any difficulties, and I will address them too if I can.